Like the other Silicon Valley monopolies, Google habitually takes the side of Israeli occupation and war crimes in Palestine – the very term Palestine is not used by their highly influential maps app. A new report by a Palestinian human rights group last month exposed the depths of Google’s dedication to the Israeli occupation. With a known history documented back more than 3,200 years, the name “Palestine” is the only term continuously used for the entire territory of the country lying between the Jordan River and the Mediterranean Sea. Palestine is the most historically accurate term. But since 1948, when Zionist militias expelled the majority of the Palestinian population from the country by force, a new state, “Israel”, was established. That state has never declared its borders. The new report, by 7amleh (Hamleh), a Palestinian organisation advocating online rights, details how Google seems to almost go out of its way to eradicate the reality of Palestinian life. 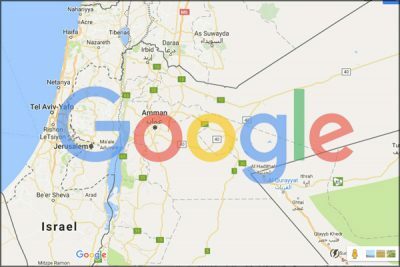 In 2016, Google came under fire from Palestinians on social media when the terms “West Bank” and “Gaza” disappeared from Google Maps. Google said that the removal of these terms was down to a glitch and that they had never used the word Palestine in the first place. There are further aspects of the way Google has wiped Palestinian life off the map though. As the 7amleh report maps in some detail, Palestinian villages in the Naqab (Negev desert) deemed “unrecognised” by Israel (inside of what is sometimes termed “Israel proper” – the territories of Palestine occupied in 1948) are not properly mapped by Google. Israel has repeatedly attempted to physically remove these villages, but has repeatedly failed, thanks to the resistance of the Palestinians who live there, and thanks also to national and international solidarity shown to those villages. Their Israeli (lack of) status as “unrecognised” also means that the state refuses to connect the villages to basic services like water and electricity – despite the fact that nearby Israeli-Jewish settlements are given all the support possible. Google Maps acts in a discriminatory manner towards the unrecognised village the same [way] as the Israeli government does. Google ignores the existence of these villages just like Israel and for me if you do not exist on the map it means that you are invisible and that’s exactly what Israel wants us to be. This solidarity with Israeli racism expressed by Google’s helpful attitude towards Israel’s wiping of Palestinians quite literally off the map extends across the 1967 “Green Line” ceasefire boundary. Palestinian villages even within the “West Bank” area of the Jordan Valley are not properly mapped by Google either. The report documents that while Israeli settlements “can be seen when looking at the larger area of the map” some Palestinian villages are only visible when zoomed in – and even that only as a result of pressure being put on by a human rights organisation. Google also refuses to recognise or map the reality of Israel’s apartheid roads system for Palestinians. As part of Israel’s ongoing settler-colonisation of Palestine, large parts of the West Bank – which is ruled by Israeli military decree – are prohibited access for Palestinians. Many roads are reserved for the use of Jews only. Despite the illegality of these practices under international law, Google’s route-planning apps do not designate Israeli settlements in the West Bank as illegal. Google should be compelled to end its complicity with Israeli racism and apartheid.